Partly cloudy skies early will give way to cloudy skies late. A stray shower or thunderstorm is possible. Low around 60F. Winds SW at 10 to 15 mph. IRONTON -- Charles Blaine Sr., 76, of Ironton was born April 19, 1942, to the late Grandville and Mable Blaine. Charles passed away in his home January 30, 2019. Charles leaves behind a sister, Bonnie Milia; brother, Peter Milia; sons, Charles (Pam) Blaine Jr., and Christopher (Danielle) Blaine; daughter, Cynthia (Trisha) Sobus; grandson, Nathan (Carly); granddaughter, Elizabeth (Curtis) Hayes; great-granddaughter, Amara Hayes. Charles was also survived by his loving wife of 37 years, Dolores Blaine of Ironton. Services with Full Military Honors were handled by Coplin Funeral Home at Bismarck Church of God with Rev. Bobby Adams officiating. PARK HILLS -- Fern L. Jones of Park Hills, Missouri, went to her Heavenly Home Monday, March 4, 2019, having reached the age of eighty-two years, one month and nineteen days. Fern was born January 16, 1937, in Park Hills, a daughter of the late Pony Reed and the late Maple (Womack) Reed. On December 12, 1952, Fern was united in marriage to Jim Jones and there were eight children born to this union. In addition to her father and mother, Fern was preceded in death by her husband, Jim Jones; daughter, Darlene Jones; two sons, Darin and Doyle Jones; and two brothers, Charlie Reed and Virgil Reed. Survivors include her five sons, Jimmie Jones, Pastor Darrell (wife, Patty) Jones, Earl Duane Jones, Pastor Derek (wife, Caroline) Jones, Pastor Dwight (wife, Tammy) Jones; five siblings, Roy Reed, Christine Eaton, Paul (wife, Anne) Reed, Harold (wife, Barb) Reed, Sharon (Ron) Eaton; also surviving are a host of grandchildren and great-grandchildren; nieces, nephews, and extended family. The family will receive friends 10 a.m.-1 p.m. Friday, March 8, 2019, at Harvest Christian Centre, 1925 Highway 32, Park Hills, Missouri. A Funeral Service will follow at 1 p.m. Friday, March 8, 2019, at Harvest Christian Centre. Officiating her service will be Pastors Darrell, Derek and Dwight. Honoring Fern by serving as pallbearers will be Jeremy Jones, Tim Jones, Andy Jones, Michael Jones, and Daniel Jones. Interment will be in the Layne Cemetery. Funeral arrangements were respectfully entrusted to the care and direction of the DeClue Funeral Home. To send flowers to the family of Fern L. Jones (Reed), please visit our Heartfelt Sympathies Store. POTOSI -- Lindell Akers of Belgrade, Missouri, was born March 1, 1927, in Caledonia, Missouri, a son to the late John Thomas Akers and the late Muriel E. (Furry) Akers. On December 25, 1949, Lindell was united in marriage to Bertha Lou Dennis and they shared nearly sixty years together. Lindell passed away Saturday, March 2, 2019, at the age of 92. In addition to Lindell’s father and mother, he was preceded in death by his beloved wife, Bertha Lou; son, Mark Lyn Akers; two brothers, Gracin Akers and Carl Akers; father-in-law and mother-in-law, James and Eva Dennis; three nieces and two nephews, Michael Akers, Cathy Censky, Norma Perrin, Dale Dennis and Kevin Maxwell. Survivors include his son, Kim (wife, Sandra) Akers; daughter-in-law, Sharon Akers; grandchildren, Sean (wife, Tara) Akers, John Akers, Hannah Akers, Zoe Akers and Will Akers; two great-grandchildren, Aniya and Ezra Mark; sister-in-law, Mary Lou Akers: brother-in-law, Stanley Jarvis. Also surviving are a host of nieces, nephews, extended family and friends. The family will receive friends 4:30-8:30 p.m. Friday, March 8, 2019, and 9-11 a.m. Saturday, March 9, 2019, at DeClue Funeral Home. A Funeral Service will be conducted 11 a.m. Saturday, March 9, 2019, at DeClue Chapel with Pastor Rick Lasley officiating. Interment will follow in the Caledonia Methodist Cemetery. Funeral arrangements were respectfully entrusted to the care and direction of the DeClue Funeral Home. Online condolences may be expressed by visiting decluefuneralhome.com. To send flowers to the family of Lindell Akers, please visit our Heartfelt Sympathies Store. FARMINGTON -- Elaine Carol Grimes, of Farmington, passed away on March 7, 2019, at the age of 76. Arrangements are pending under the care and direction of Cozean Memorial Chapel and Crematory. DESLOGE -- Lloyd Pritchett, 79, of Desloge, passed away at his home on March 6, 2019. He was born August 27, 1939, in Flat River, to the late Presslie and Vernetta (Morice) Pritchett. Lloyd worked several years for Coca-Cola and after retiring, he enjoyed trips to Gulf Shores, sudoku and solitaire. He was a long-time member of the Immaculate Conception Catholic Church in Park Hills. He was preceded in death by his parents; siblings, Sybil Counts, Leroy and Leonard Pritchett. Lloyd is survived by his loving wife, Martha Ann (Marks) Pritchett; siblings, Larry (Janet) Pritchett, Pauline Seabaugh, and Linda (Harry) McEntire; several nieces, nephews and dear friends also survive. Visitation will be held at C.Z. 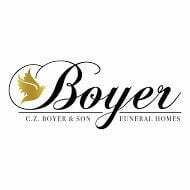 Boyer and Son Funeral Home in Desloge, Friday, March 8, 2019, from 5 p.m. until 8 p.m. A 10 a.m. Funeral Mass will be held Saturday, March 9, 2019, at Immaculate Conception Catholic Church in Park Hills. Interment will follow at Immaculate Conception Catholic Church Cemetery in Park Hills. Memorials may be directed to St. Vincent de Paul food pantry, St. Jude Children’s Research Hospital, or Shriners Hospitals for Children. Please view full obituary and share condolences online at www.czboyer.com. LEADWOOD -- Lucille McCarver, 99, of Strafford, passed away March 6, 2019, at Strafford Center. She was born November 21, 1919, in Irondale, to the late Frank and Maude (Nixon) McFadden. Lucille was also preceded in death by her husband, Orville McCarver and several brothers and sisters. She is survived by two sons, Oliver McCarver and wife Pat, and Thomas McCarver; three grandchildren, Kati (Matt) Fisher, Casi (Fines) Massey, and Chris McCarver; five great-grandchildren, Isa Lindsey, Hayden Massey, Conner Massey, Baby Fisher, and Nick McCarver; several nieces and nephews also survive. A graveside service will be held Saturday, March 9, 2019, at Leadwood Cemetery in Leadwood. The procession will leave C.Z. Boyer and Son Funeral Home in Desloge, at 12:45 PM. Jeff Wann will be officiating. Please view full obituary and share condolences online at www.czboyer.com. PARK HILLS -- Frankie (Weiss) Grayson, 79, of Park Hills, passed away March 4, 2019, at Missouri Baptist Hospital. She was born July, 25, 1939, in Elvins. She was preceded in death by her parents, Les Weiss and Georgia 'Crites' Weiss; sister, Jeanie Tiefenauer; and a brother, Darrell Weiss. Frankie is survived by her husband, Robert Grayson; two sons, Dale McFarland, and David McFarland and friend Diana; many grandchildren and great-grandchildren; one brother, Tom Weiss and Charlotte; and one sister, Cathy Lange. Visitation will be 5-8 p.m. Friday March 8, 2019, at Horton-Wampler Funeral Home in Park Hills. A funeral service will be held 11 a.m. Saturday March 9, 2019, at Horton-Wampler Funeral Home. Burial will at Old Pendleton Cemetery in Doe Run. FARMINGTON - Roy Clark Jr., of Farmington passed away March 4, 2019. Visitation Thursday from 7 a.m. until time of service at 11 a.m. at Cozean Memorial Chapel. View the full obituary at cozeanfuneralhome.com. FARMINGTON – Steve London memorial service at Cozean Memorial Chapel at 5:30 p.m. Thursday. View the full obituary at cozeanfuneralhome.com. FARMINGTON -- Patricia Ann Mayfield of Farmington passed away at Parkland Health Center on Friday, March 1, 2019, at the age of 87. She was born in St. Charles, Illinois, to the late Charles Davis Jensen and Myrtle (Nanny) Jensen. In addition to her parents she was preceded in death by her loving husband of 52 years, John Dee Mayfield in 2001; and her sister, Carol Jensen. Pat as most knew her grew up in Centralia, Illinois, where she graduated from high school. After her marriage in 1949 to John they made their home in Centralia and Mount Vernon before relocating to Flat River in 1961. She worked as a bookkeeper at Central High School until 1975 before becoming a real estate broker. She was well known for having a successful real estate business in the area, Mayfield Real Estate agent. Pat was a faithful member of Farmington First Baptist Church. Community involvement was important to Pat and she belonged to various civic organizations, including the Newcomers Club. She was a life time member of Beta Sigma Phi. An accomplished bridge player, she played both off line and on line with bridge players all over the world. In recent years Pat enjoyed living in assisted living at Presbyterian Manor where she enjoyed the many friends she met and having the time for her passion, reading. Her children will always cherish their mother's devoted love for them and for her grandchildren and great grandchildren. Survivors include her three children, Linda McLane and her husband, Dennis, Mary Taylor and her husband, Ralph, and John and his wife, Kerry; six grandchildren, Kyle McLane, Colin McLane, Tyler McLane, Brandi Taylor, Allie Brosch and Anne Mayfield; three great-grandchildren, Harlow and Lily McLane and Theodore “Teddy” Brosch; and an aunt who was like a sister to her, Mary Ann Placovich. She also leaves behind a host of good friends. Visitation abnd services were held Tuesday, March 5, 2019, in the Cozean Chapel. Interment will be private. Memorials, if desired, may be made to Presbyterian Manor's Good Samaritan Fund or to MCII Sheltered Workshop in Farmington. View the tribute video and share your condolences at cozeanfuneralhome.com. FARMINGTON -- Steve London, 57, passed away at Mercy South Hospital on March 1, 2019. There will be a Memorial Service on Thursday, March 7, 2019, at Cozean Memorial Chapel at 5:30 p.m. View the online obituary and share your memories at cozeanfuneralhome.com. FARMINGTON -- LeRoy P. Pogue, 84, of Fulton, Missouri, formerly of Farmington passed away February 24, 2019. He was born November 19, 1934, in Roselle, Missouri. LeRoy retired as the Plant Manager after 45 years of employment with the So Good Potato Chip Company and Backers Potato Chip Company. He was a member of the Farmington Elks Lodge #1765 for 58 years. He enjoyed hunting, fishing, watching St. Louis Cardinal Baseball and especially traveling, having visited every state in the U.S. He was preceded in death by his parents, Fred and Eva Pogue; wife, Rita Pogue; one brother, Donald Pogue; four sisters, Kathryn Brewington, Leona Pinkley, Dorothy Kustudich and Valerie Webb. LeRoy is survived by four children, Deborah Schrum and husband Wayne, Kenneth Pogue and wife Alison, David Pogue and wife P.J., Michael Pogue; twelve grandchildren, Braden (Amanda) Schrum, Vince (Briane) Schrum, Sarah (Brett) Groeteke, Crystal Pogue, Erica Batson, Ryan Batson, Nathan (Marissa) Pogue, Casey (John) Quarando, Noah Pogue, Luke Pogue, Jacob Pogue, Eli Pogue; eleven great-grandchildren, Gracie and Gatlin Schrum, Brynleigh and Nadalyn Schrum, Brilee and Ava Goeteke, Braelynn Trail, Hudson Pogue, Avery, Amelia and Aria Quarando; sister, Marelle (Glen) Schleper. Several nieces, nephews and a host of friends also survive. Private services will be held at a later date. Arrangements are under the direction of C.Z. Boyer & Son – Taylor Chapel in Farmington. View obituary and share condolences online at www.czboyer.com. FARMINGTON – Roy E. Clark Jr. of Farmington, passed away on March 4, 2019, at Camelot Nursing Center in Farmington at the age of 76. He was born on November 5, 1942, in St. Louis, Missouri, to the late Roy Clark and Larinda “Edith” (Guitar) Clark. In addition to his parents, he was preceded in death by his stepfather, James Meek and his stepbrother, J.W. Meek. Roy was a former pipe fitter and a member of Pipeliners Local Union 798. He proudly served his country as a veteran of the United States Navy. He was a life member and past State Commander for Amvets Post #113 of Farmington and was inducted as the youngest Commander for the VFW Post #5896 of Farmington. Roy was a Master Mason of the Pendleton Masonic Lodge #132 and a Noble of the Mystic Shrine in the Moolah Temple. He enjoyed playing pool. He loved to dance and competed nationally in his younger years. Roy will be fondly remembered and dearly missed by all who knew and loved him. Roy is survived by his son, Roy Clark III of Ironton, his stepmother, Genevieve (Knuckles) Clark of Farmington, his brothers, Gregory Lee (and wife Donna) Clark of Festus, Roger Lynn (and wife Dawn) Clark of Terre du Lac, and William “Bill” LJ Clark of Farmington, along with several nieces, nephews, cousins, and friends. Friends may call on Wednesday, March 6 from 5-8 p.m. at Cozean Memorial Chapel. Visitation will resume on Thursday, March 7 from 7 a.m. until time of service at 11 a.m. in the Cozean Chapel. Interment with full military honors to follow at Jefferson Barracks National Cemetery. Memorials, if desired, may be made to Cozean Memorial Chapel to assist with funeral expenses or to the Wounded Warrior Project, P.O. Box 758517, Topeka, KS 66675-8517. View the full obituary and share your condolences at cozeanfuneralhome.com. PARK HILLS -- William “Bill” Baldwin, 72, of Park Hills, Missouri, passed away February 28, 2019, at his residence. He was born February 27, 1947, in Bonne Terre, Missouri. Bill retired after 26 years with the U.S. Coast Guard. He was a member of the Elvins Baptist Church. He was preceded in death by his parents, Tobe and Ida (Kearns) Baldwin; sister, Rita Holloway; father-in-law and mother-in-law, Bill and Frances Lee; and brother-in-law, Billy Lee Jr.
Bill is survived by wife Sheila (Lee) Baldwin of Park Hills; daughters, Trisha Stanley and husband Patrick of Arnold, and Krista Hahn and husband Ryan of Park Hills; son, Andrew Baldwin and wife Courtney of Denver, Colorado; four grandchildren, Aiden, Lily, and Elon Stanley, and Gwyneth Hahn; nephew, David Holloway and wife Sherry; other relatives and friends also survive. Visitation will be 5-9 p.m. Monday March 4, 2019, at Horton-Wampler Funeral Home in Park Hills. A funeral service will be held 1 p.m. Tuesday March 5, 2019, at Horton-Wampler Funeral Home with Rev. Herb McMillian. Burial at Doe Run Memorial Cemetery.